Practice Digital Communication questions and answers for interviews, campus placements, online tests, aptitude tests, quizzes and competitive exams. This set of Digital Communications Multiple Choice Questions & Answers (MCQs) focuses on “Interpolation”. Explanation: Interpolating the value requires or is done by curve fitting and regression analysis. Explanation: Interpolation provides a mean for estimating the function at the intermediate points. Explanation: Some of the interpolation techniques are linear interpolation, piecewise constant interpolation, polynomial interpolation, spline interpolation etc. Explanation: Linear interpolation is quick and easy but not precise. Explanation: Error is equal to square of the distance between the data points. 6. Which produces smoother interpolants? Explanation: Polynomial interpolation and spline interpolation produces smoother interpolants. 7. Which is more expensive? Explanation: Polynomial interpolation is more expensive than linear interpolation. 8. Gaussian process is a _____ interpolation process. Explanation: Gaussian process is a non linear interpolation process. Explanation: Interpolation is a method of adding new data points within the range of a discrete set of known data points. Explanation: Interpolation is a method of estimating the value of the function. 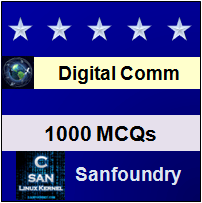 Sanfoundry Global Education & Learning Series – Digital Communications. To practice all areas of Digital Communications, here is complete set of 1000+ Multiple Choice Questions and Answers.